Just saw this one shared on Facebook by Occupy Democrats with 79k+ likes. It's a repost of this by Less Than 10 Dollars an Hour. Unless there are more recent statistics on SNAP usage than the official statistics available from the US Department of Agriculture or someone has a very creative definition of "highest useage", the statement is false. If we go back a few years, the statistics may however back the claim. In the statistics, there are two different values, which both could be described as "usage" in a colloquial language. One value is the ratio of the population receiving SNAP benefits, the other value being the average benefit amount per inhabitant. 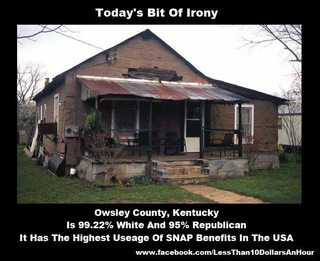 If we take a look at the latest statistics from 2010, 52.08% of the population in Owsley County received SNAP benefits, ranking Owsley behind Shannon County, SD (59.33%), Todd County, SD (55.08%) and Wade Hampton, AK (54.13%). If we go back to 2008 and earlier, Owsley County was indeed in the "lead", but the three other counties passed Owsley in 2009 when it comes to number of recipients per population count. If we look at the average payment per inhabitant, Owsley is even further down the list. The statistic contains however some very strange numbers, which seem erroneous to me. E.g. Hopewell City, VA with a population count of 22655 allegedly received $243,376,900 in SNAP benefits in 2010, making an average monthly payment per inhabitant of $895.23, or per participant of $3,051.67. There's another issue this question doesn't address: the 95 percent Republican part of the equation. There are 3497 registered voters in the county; 917 are Democrats; 67 are neither GOP or D. That makes the registered voters in the county about a quarter registered Democrats. In 2012 election, about 17.9 percent of those who cast ballots voted for Obama. The number of voters who cast ballots for Obama in 2012 must be considered as a subset of the number of people who voted, not as a percentage of the population as a whole. Claims of snap-usage: the actual claim to having the highest usage (percent of population) of snap benefits is correct for the year 2008. See Tor's answer below. I also think given the proximity to a claim about Republican votership it makes more sense to interpret this in the terms of percentage of the population. Why would it otherwise make a material difference if they received the most in SNAP benefits but it all went to one person? The point of the graphic is to raise the point of people voting against their interest which is why it was shared on Occupy -Democrats-, and titled "Today's Bit of Irony". Claims of percentage Republican: it's incorrect for any year. In 2008 for instance, %75.9 voted for the Republican ticket. In 2012 that number went up a bit, 81.88% cast a vote for the Republican ticket. It's a gross super majority either way, but it's not a 95% majority. In 2008, 75% were registered Republicans. Currently as of 2014-01-23, it's 70%. So had the percentage of Republicans been 76% rather than 95% I'd have said it was true. As it sits, it's only MOSTLY TRUE. And, the graphic doesn't seem to be from the county, but I kind of figured it was a stock image anyway. Does the Defense establishment have plants in vast majority of Congressional districts? Does the US have the highest “natural” life expectancy?